Taxus cuspidata.underside of needles.Glen Mittelhauser.New England Wild Flower Society.gobotany.newenglandwild.org (Accessed 8/2014). 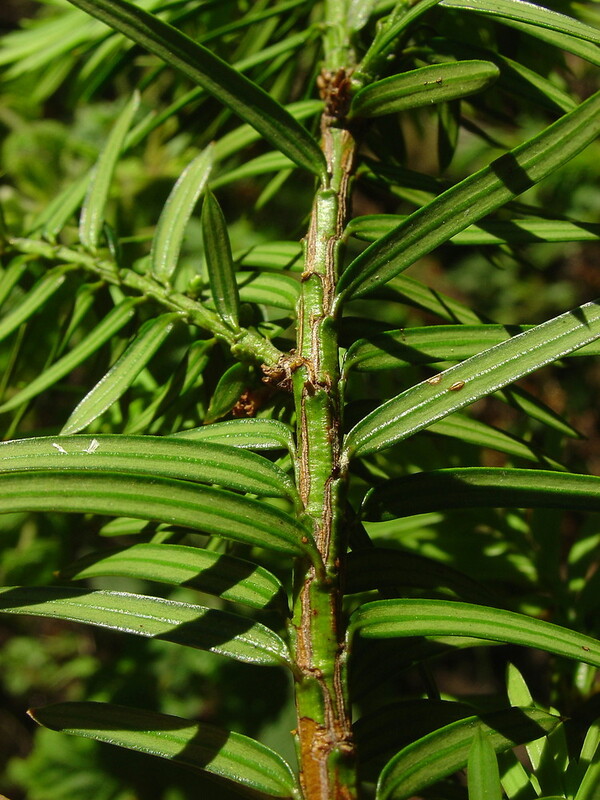 Taxus cuspidata.upper side of needles.© 2010 Will Cook.carolinanature.com (Accessed 3/2017). Leaves spiraled, but appearing ranked, ascending to form a ‘V’ shaped profile on twig, flattish, needle-like, 0.2-0.3 cm wide, midrib prominent above, abruptly pointed tip sharp; dark green above, paler with 2 tan bands below, evergreen, scales of winter buds keeled (Rehder 1986). 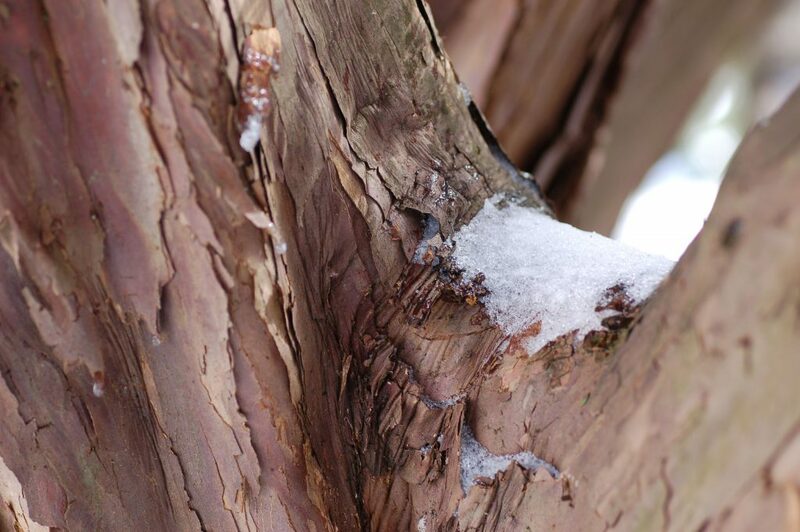 Taxus cuspidata (Japanese yew ) Bark. en.wikipedia.org (Accessed 8/2017). Flowers: No flowers. Male and female cones on different plants (dioecious). Fruit: No true fruit. Female cone consists of seed covered by a fruit-like, bright red, translucent, fleshy aril. Aril eaten by birds that disperse seeds. 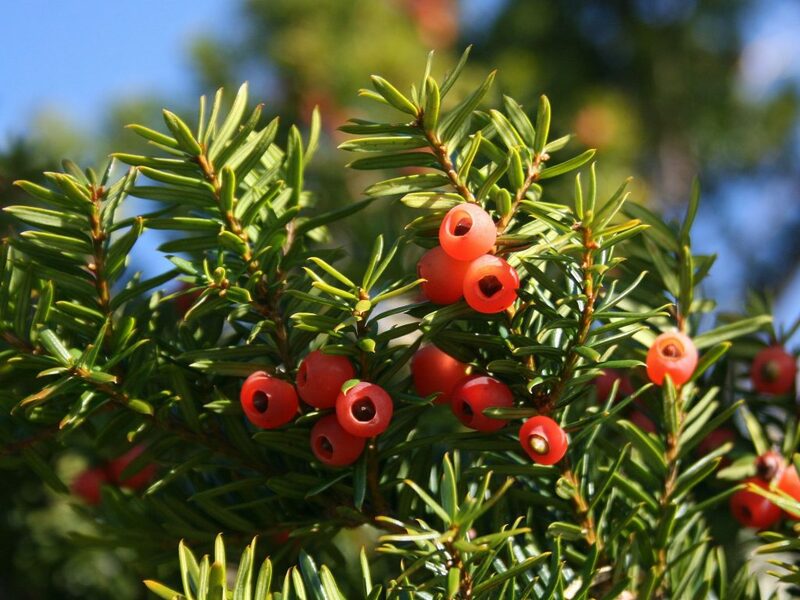 The aril is the only part of Taxus that is not toxic (Del Tredici 2010). Taxus cuspidata (Japanese yew), fruit-like arils surrounding seed. en.wikipedia.org (Accessed8/2017). Habitat: Escapes from cultivation. Old house sites, in yard waste. Notes: Sometimes dispersed by birds into woodlands. Foliage eaten by deer (Martin et al. 1951). 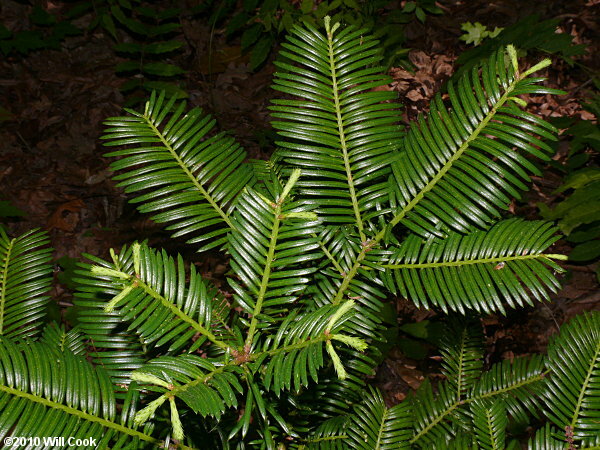 Needles, bark and seeds contain taxine, a very toxic alkaloid (Kingsbury 1964). The red pulp of the fruit-like aril surrounding seed is not toxic.